Pete Monaghan was born in 1961, in Stroud, Gloucestershire, of Anglo-Irish parentage he works from studios in west Wales and southern Germany. After initial training in mechanical engineering and then technical illustration he subsequently spent over twenty years in Germany working as an illustrator. He seeks to integrate the strict illustration disciplines with an irrepressible passion for drawing and painting. In his paintings he depicts vernacular architecture in a fusion of abstraction and figuration, calling on a depth of drawing expertise to produce work in acrylic and mixed media with collage. His background in illustration feeds into the paintings. Working in acrylics on wood panel using crayons, markers, collage and spray paint he likes to retain portions of each painting as a drawn element reflecting the fragility and temporality of the structures. His work is part representation, part visceral interpretation. "My work always begins with sketching on location. Subsequently re-sketching many times in the studio in order to interpret and understand. Only when I have drawn sufficiently do I feel the freedom to splash and pour paint, enticing abstraction, entering into a dialogue of controlling and letting go. My work is in response to place. I feel drawn to the celtic fringes of the UK and Ireland along with the higher slopes of the Alps. 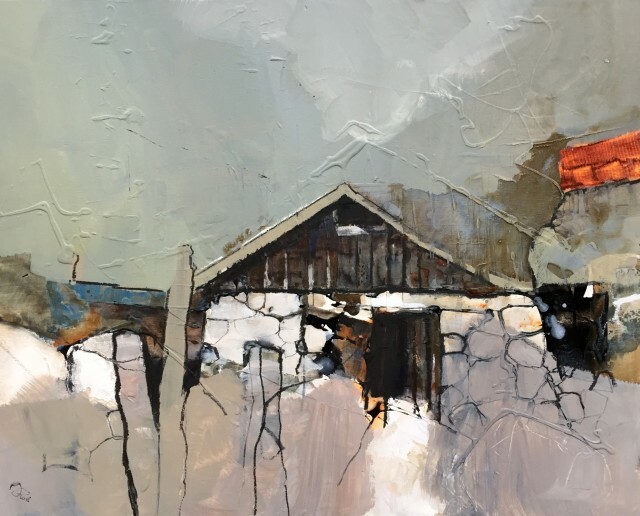 I depict vernacular architecture; buildings that have grown out of the landscape, where local materials were used in construction and function took precedent over aesthetics." Pete had his first successful exhibition with us in 2016, 2017 & 2018. Pete has another exhibition with us in May 2019.